You will soon see the new generation of 2019 Lexus ES at Spinelli Lexus Pointe-Claire. With the exceptional tranquility of its interior and comfort worthy of the goddesses of the road, the 7th generation ES raises the level of excellence on every front. This is evidenced through its striking style, its lavish interior decor and its exhilarating performances. Spinelli Lexus Pointe-Claire, the Lexus dealership of the West Island of Montreal, will soon have the honor to present this outstanding sedan to its clients. To allow drivers from either Montreal, Laval or the South Shore of Montreal to fully enjoy the new driving dynamics of the 2019 ES, Lexus engineers fitted it with a 3.5-litre direct injection V6 engine that produces 302 horsepower, paired with an 8-speed gearbox. The hybrid version of the 2019 Lexus ES soon to be unveiled at Spinelli Lexus Pointe-Claire, in the West Island of Montreal and close to downtown, the ESh, is fitted with a 4th generation Lexus Hybrid System, more powerful, with improved accelerations and significantly enhanced fuel economy. The gas model and the hybrid model of the Lexus ES 2019 both get an all-new suspension system, including double wishbone in the rear. 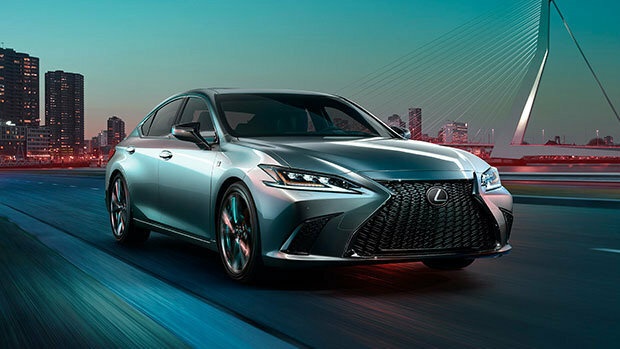 Every next generation 2019 Lexus ES that you will see at Spinelli Lexus Pointe-Claire is armed with innovations that is a promise of vehicles to come. On board the 2019 ES, you will find the Lexus Safety System+ 2.0, a next generation multimedia system, a digital speedometer and several available options including Head-Up Display, a Mark Levinson Audio system with 17 speakers, a Hands-Free Power Trunk, and Noise Cancelling Alloy Wheels. The ES F SPORT version that will also be presented by Spinelli Lexus Pointe-Claire in the West Island, close to Laval and the South Shore of Montreal, will offer a unique exterior design with a black spindle grille and 19” 5-twin spoke wheels. And on the interior, you will find two-tone seats and “Hadori” aluminum trims that channels the spirit of a traditional Samurai sword. The Sport S+ drive mode paired with a sport-tuned adaptative variable suspension and imposing brakes translate the more aggressive looks of the 2019 Lexus ES F SPORT into highly dynamic performances. The Lexus financing programs, coupled with the promotions offered by Spinelli Lexus Pointe-Claire, encourage the acquisition of this outstanding car which constitutes a true investment in your quality of life.